Matt Banker, John Dodd, Paul Rice, Arun Dhand and Tom Dubrule. 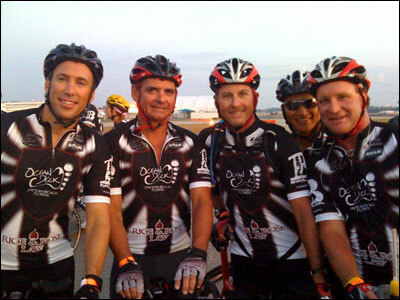 Paul Rice, middle, is seen here with some fellow cycling teammates prior to the start of the 2009 MS 150 Ride to the Shore fundraising event. Rice & Rose was the primary sponsor of the Daytona Beach area team organized by Plan B Cycling. The Plan B team had approximately sixty cyclists participating in the 150 mile event involving some 2500 cyclists who raised money for National Multiple Sclerosis Society. The two day event began on Saturday, October 3, 2009 in St. Augustine, Florida and wound through rural areas of St. Johns and Flagler Counties to S.R. A1A along the coast to Daytona Beach. The cyclists enjoyed festivities and camaraderie Saturday night and returned to St. Augustine via their cycles on Sunday morning.